In order to assure that criminal trials are fair, both prosecutors and defense attorneys are held to a complicated set of rules and regulations. The complexity of these cases requires that a defense attorney have expertise and experience. A defense attorney should be involved in a case as soon as possible- ideally, even before police have interrogated a person. When an individual is arrested, the law enforcement officers that arrest them are required to inform the arrested person of their right to an attorney and to have an attorney appointed if they cannot afford legal representation. These warnings are called “Miranda warnings”, after the 1960s United States Supreme Court case that first required them. 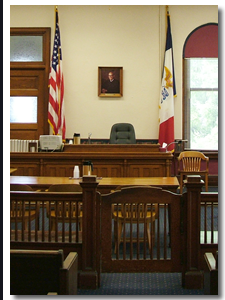 Contact an Iowa criminal defense lawyer representing clients in Forest City, Iowa today to schedule your initial consultation. It is sometimes possible for a defendant or defense attorney to negotiate with the government. The prosecutor may agree to drop charges or recommend certain punishment if the defendant pleads guilty to the charge. In all cases, the decision to plead innocent or guilty rests with the defendant. An experienced lawyer can work to find the best possible deal for their client. If this is not possible, the lawyer will fight in court for their client to convince the jury that there is reasonable doubt as to whether the defendant is guilty.